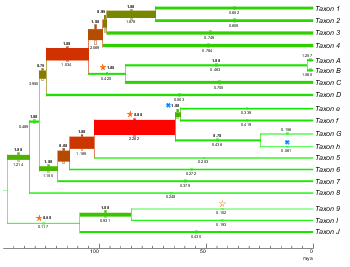 TreeGraph 2 is a is graphical editor for phylogenetic trees, which allows to apply various of graphical formats and edit operations and supports several (visible or invisible) annotations attached to nodes or branches. Data can be imported from many tree formats, tables and BayesTraits output. A key feature is the interactive comparison and combination of alternative topologies from different analyses. TreeGraph 2 is licensed under GNU General Public License. TreeGraph 2 is developed by Ben Stöver, Sarah Wiechers, and Kai Müller. If you need help on using TreeGraph 2 or want to know more feel free to ask a question on its ResearchGate project page or contact support bioinfweb.info. You can find more software developed by the authors at http://bioinfweb.info/Software. Generate commands and import data for ancestral state reconstruction. The command line based precursor of TreeGraph 2 allows creating annotated trees in a LaTeX like language and can be found under http://treegraph.bioinfweb.info/Version1. A new version of our library for reading and writing of phylogenetic file formats through one event-based interface was released. 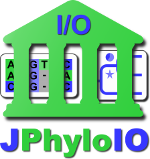 A web service for JPhyloIO that lists event streams produced from any phylogenetic input file is now available as part of the JPhyloIO documentation. It allows developers to easily inspect the stream of linear data events JPhyloIO produces from a MSA or tree document. This is helpful for getting started with JPhyloIO or for debugging purposes. A new version of PhyDE 2 is now available. It allows to edit several multiple sequence alignments at the same time. A new version of our Java library bioinfweb.commons has been released. It consists of different modules to be used in bioinformatics or in a general purpose that are made available under GNU LGPL 3. A new version of our application to visually compare alternatibe multiple sequence alignments of the same dataset is available. This is the first feature-complete version of AlignmentComparator that now allows to compare any number of alignments and to attach notes to the comparison. TreeGraph 2: Combining and visualizing evidence from different phylogenetic analyses.